What is better than pancakes on a Sunday?! 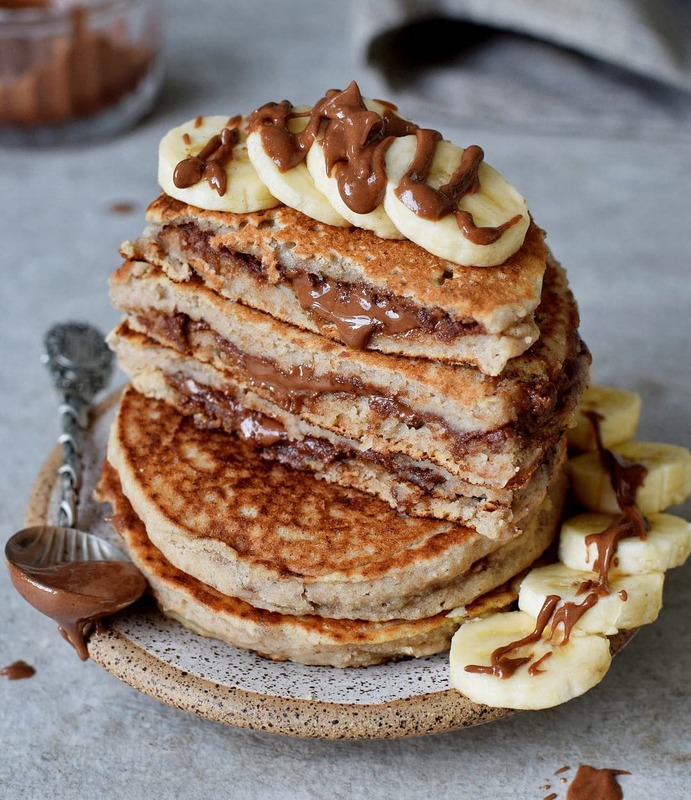 Chocolate stuffed pancakes, of course! This was the third time I made this delicious treat, and because I love it so much, I want to share the recipe with you all. These pancakes are not only a great dessert, but they are also a wonderful breakfast, especially on Sundays. I am sure you have already heard of #pancakesunday before, it’s very popular on Instagram. Regular pancakes are amazing, no question, but these chocolate stuffed pancakes are the real deal. Once you make them, you don’t want to eat “normal” pancakes ever again, because these are really addictive, haha. The first time I heard about chocolate stuffed pancakes was when I made a search on Pinterest for stuffed pancakes. 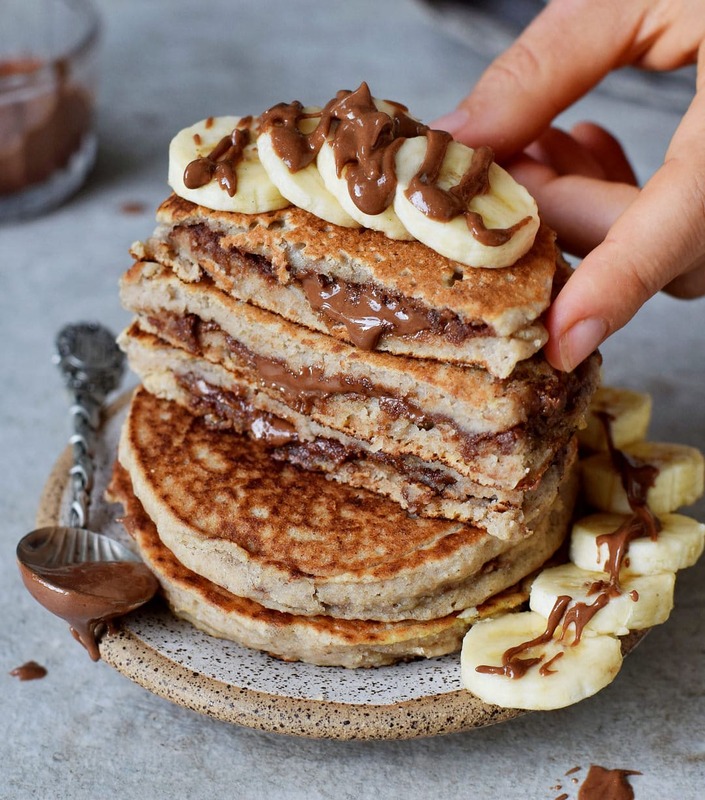 I saw a couple of recipes for Nutella® stuffed pancakes and I was intrigued and thought I could veganize them! I created my own recipe and I am so excited to share it with you. 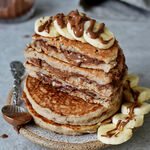 These chocolate filled pancakes are vegan, gluten-free and you will only need a few ingredients and you most likely already have all of them at home! As an egg replacement, I used one small banana and 1 tbsp of ground chia seeds. You can also use ground flax seeds and applesauce if you don’t like the taste of bananas. Instead of cow’s milk, I used plant-based milk (I always mix canned coconut milk with water in a 1:1 ratio) but you can use any other plant-based milk of choice. My pancakes turned out really fluffy with a mixture of oat flour and rice flour. But any flour (except coconut flour) should work fine, for example, buckwheat flour, quinoa flour etc. Please leave a comment below if you make these chocolate stuffed pancakes. You can also make a photo of them and post it on Instagram (or send me a DM). If you tag me in the caption + photo with @elavegan and use the hashtag #elavegan I will gladly check out your post and leave a comment. These chocolate stuffed pancakes are a wonderful dessert and a great breakfast on weekends. They are vegan, gluten-free, and easy to make. I have recently updated the recipe for an improved chocolate spread. Start by making the chocolate filling. 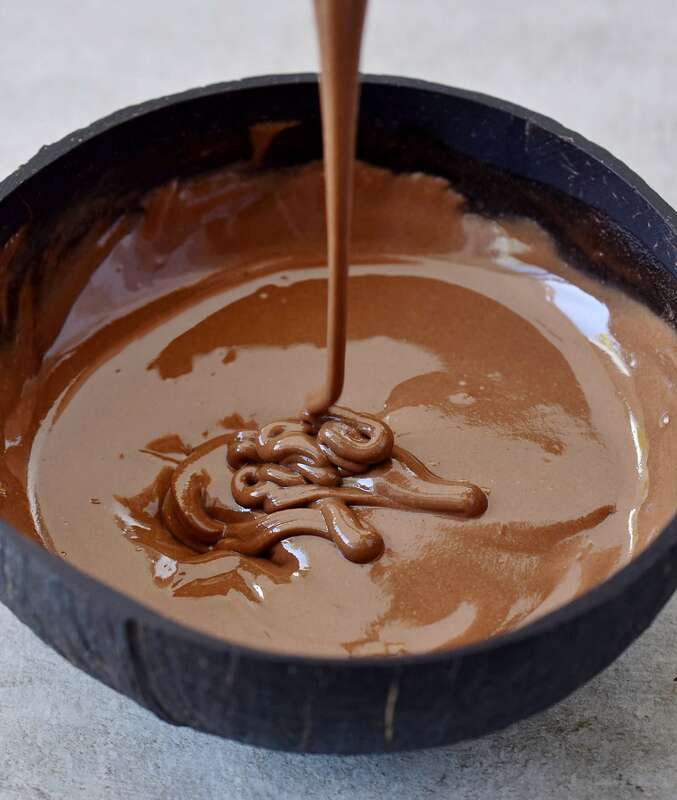 Put all "chocolate filling" ingredients into a small bowl and stir with a whisk. Spoon the chocolate spread into a silicone mold (see pic below). You will need to make 6 "chocolate discs" in total. Put the mold into the freezer for about 30 minutes. To make the pancakes simply put all dry ingredients into a bowl and stir with a whisk. Pour the wet ingredients into the bowl of dry ingredients and stir with a whisk to combine (don't overmix the batter). Once the chocolate discs are firm, you can start making the chocolate stuffed pancakes: Preheat a skillet to low-medium heat and add a little bit of oil (or use cooking spray). Pour about 1 1/2 heaped tbsp of the pancake batter into the skillet, spread it and place 1 frozen chocolate disc into the center of the batter. Add more batter (approx. 1 1/2 tbsp) to cover the chocolate. Put a lid on the skillet and cook the pancake for about 3 minutes. Flip the pancake and cook if from the other side for a further 2 minutes or until golden brown. Continue with the remaining 5 pancakes (Tip: Use two skillets at the same time to save time). Keep the pancakes warm until you serve them. Enjoy with banana slices and a chocolate sauce! To make oat flour simply process oats in a blender. You can use 80 g of applesauce instead of banana. The chocolate filling isn't very sweet (I used sweetened sunflower seed butter). If you prefer it sweeter, then add 1-2 tbsp maple syrup (or more to taste). You can use any nut butter of choice, e.g. hazelnut butter, peanut butter, cashew butter etc. Oh my goodness, I am drooling! 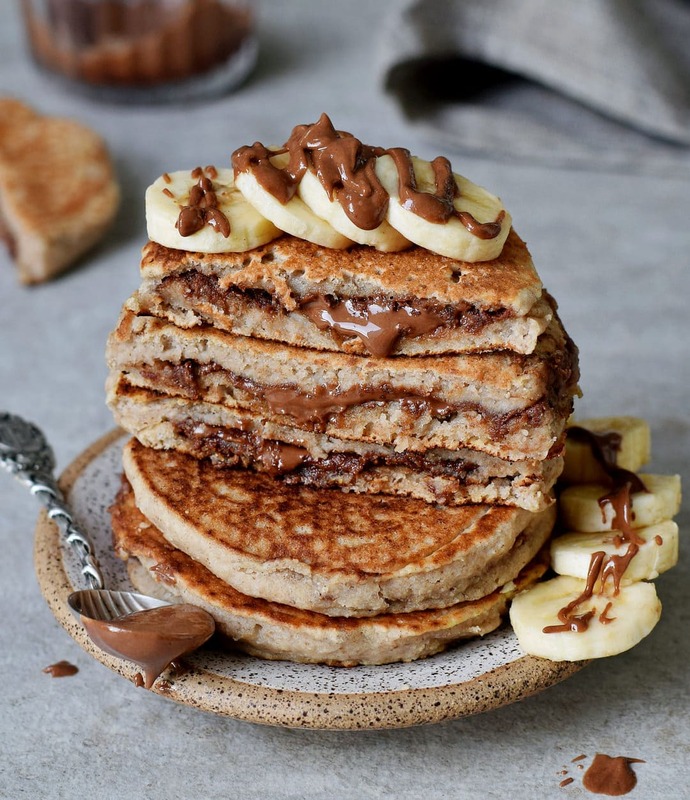 Your version of Chocolate Stuffed Pancakes looks and sounds decadent and so comforting ???? I would like to have a bite right now. Happy Sunday! It looks amazing, can’t wait to try the recipe! I’ll try to make them, not this Sunday cause it’s mother’s day and my boys never let me do nothing on that day, but the next Sunday I’ll sure make them. Hope they turn out as pretty as yours. Thank you so much for sharing this delicatessen with us. Have a wonderful day ???????? These are amazing Ela! Nothing like chocolate and pancakes for the most amazing brunch ever! 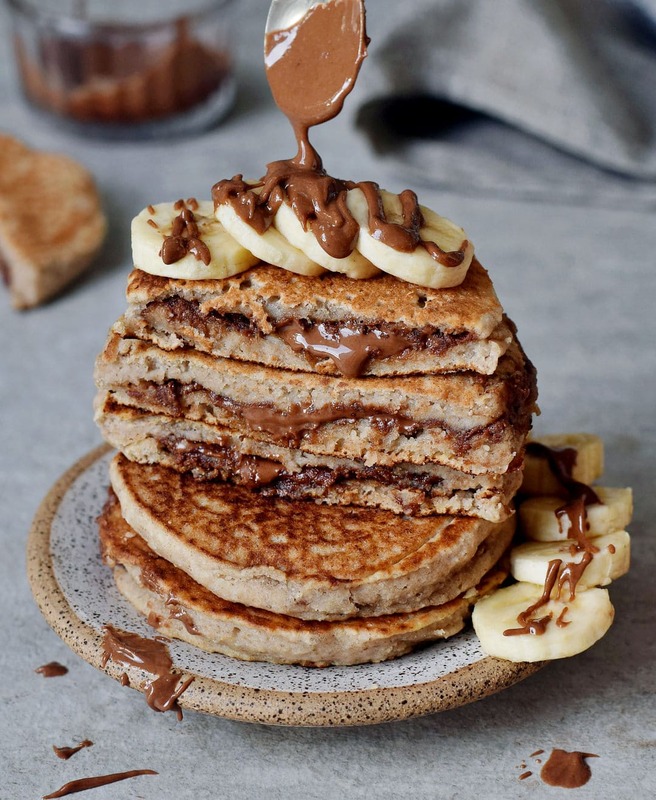 This is such a great idea to fill pancakes with chocolate ???? It was a very delicious combo! Thank you, Bianca ???? I made these with oat and almond flour and pumpkin instead of bananas and they turned out great! Hi Kate, you could leave it out completely and just mix cocoa powder, agave/maple syrup and coconut oil. It will have a different texture but the taste should be great as well. Or you can simply melt dairy-free and nut-free store-bought chocolate chips. Hope this helps. Ela! Your recipe is truly genius ! Stuffing pancakes with chocolate? Who knew pancakes could be improved! Hi Ela! Thanks for all the great recipes! What can u change the rice flower with? I don’t have that at home and once I have tried grounding rice in the coffee grinder, but it didn’t Tür out very well… i have ground almonds, or other flowers (doesn’t have to be gluten free for me). Thanks! !